Department of Medicine, Division of Gastroenterology & Hepatology and Program in Oncology, University of Maryland School of Medicine, Baltimore, MD, USA. Colorectal cancer (CRC) is a leading cause of cancer mortality worldwide. Although curative treatment options for advanced disease are still lacking, rapid progress has been made in the last decade in understanding the molecular mechanisms underlying CRC tumorigenesis and progression. Also, robust preventive measures and novel therapies resulted in decreased CRC incidence and improved survival. Reviews in this special issue will allow readers to gain insights into the current states of CRC prevention, detection, treatment and its unique molecular mechanisms. Over the past two decades, the treatment outcomes in metastatic colorectal cancer (mCRC) have been remarkably improved, largely from the evolution of systemic therapy. Also, the molecular biomarkers have played a major role in this improvement by their predictive value in current treatment paradigm in mCRC. Currently, extended RAS mutation analysis is required for consideration of anti-epidermal growth factor receptor therapy in patients with mCRC. Several uncommon gene alterations have emerged as the potential targets for their matched molecular targeted therapy. Although, most patients with mCRC do not derive benefit from immunotherapy. By using microsatellite instability or mismatch repair test, we are now able to identify a small subgroup of patients with mCRC who have a very good response to immune checkpoint inhibitors. With the increasing number of required biomarkers in mCRC management, multiplex gene panel testing is now replacing single gene testing strategy. In patients accessible to matched molecular targeted therapy, especially for clinical trials, the comprehensive genomic profiling might be the preferred testing method. Although, it is potentially benefit in mCRC treatment, the liquid biopsy is not yet clinically applicable. The optimal utilization of molecular biomarker testing is required for best treatment outcomes in individual patients. J Cancer Metastasis Treat 2018;4:57. Colorectal cancer (CRC) represents the second most common cancer in Europe with marked differences in prognosis and response to treatments. In the past years research showed emerging interest in genomic and immunologic fields. The clinical heterogeneity, that occurs during the pathogenesis of CRC, is driven by chromosomal alterations and defective function of DNA mismatch repair genes. CRC is classified in four consensus molecular subtypes (CMS) with different immunogenic characteristics and prognosis. CMS1 microsatellite instable (MSI)-like and CMS4, both characterized by high levels of immune infiltration, are recognized as the most immunogenic subtypes, even though functional characteristic leading to different prognosis are reported. 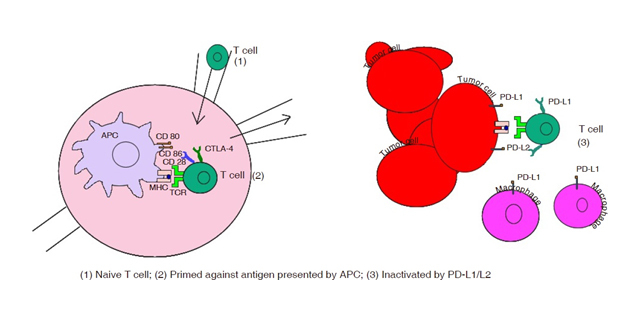 In particular, MSI tumors have been identified as the best candidates for immunotherapy treatment and a number of studies have evaluated the efficacy of anti-programmed cell death ligand-1 (PDL-1) and anti-cytotoxic T-lymphocyte-associated protein 4 (CTLA4) in this setting. However, literature data show that the majority of patients with CRC have microsatellite stable (MSS) tumors and this status seems related to lower response to PDL-1/programmed cell death-1 or CTLA4 blockade. The aim of this paper is to investigate the role of immunotherapy in MSI and MSS CRC. J Cancer Metastasis Treat 2018;4:55. Aim: Strong evidence reveals important differences between cancers in the proximal vs. distal colon. Animal models of metastatic colon cancer are available but with varying degrees of reproducibility and several important limitations. We explored whether there were regional differences in the location of murine colon cancers and assessed the utility of murine models to explore the biological basis for such differences. Methods: We re-analyzed data from our previous studies to assess the regional distribution of murine colon cancer. 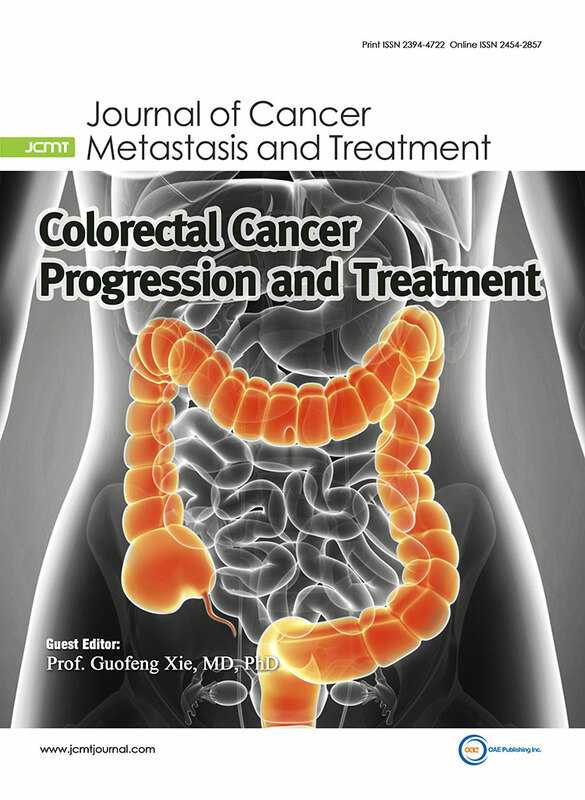 In survival surgery experiments, we injected HT-29 human colon cancer cells into the wall of the cecum or distal colon of Nu(NCr)-Foxn1nu or NOD.Cg-PrkdcscidIl2rgTim1Wji/SzJ mice and compared the development of primary tumors and metastases. 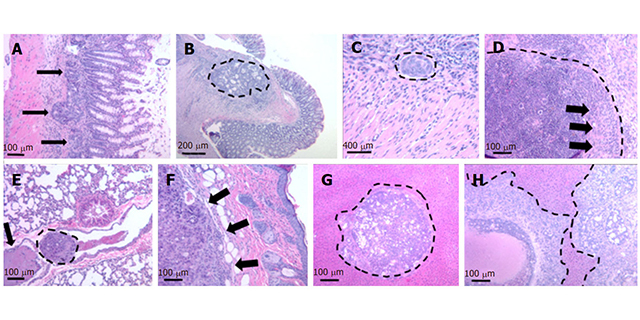 Results: Within 7-17 weeks after intramural cecal injection of HT-29 cells, eight mice failed to develop solid primary tumors or metastases. In contrast, within four weeks after cell injection into the distal colon, 13 mice developed metastases - 12 mice developed subcutaneous metastases; of these, four developed liver metastases and one developed both liver and lung metastases. One mouse developed liver metastases only. Histological examination confirmed these lesions were adenocarcinomas. Conclusion: Our findings reveal the preferential growth of murine colon neoplasia and invasive human orthotopic xenografts in the distal mouse colon. The new approach of injecting cells into the distal colon wall results in a pattern of colon cancer development that closely mimics the progression of metastatic colon cancer in humans. This novel model of colon neoplasia has great potential for exploring anatomical differences in colon cancer and testing novel therapeutics. J Cancer Metastasis Treat 2018;4:51. In the last few years, the success of anti-PD1 and anti-PDL1 drugs in solid cancers treatment and the advances in molecular biology have provided new potential treatment strategies for patients with metastatic colorectal cancer. Unfortunately, only patients with mismatch repair deficiency seem to benefit from immunotherapy and they represent a small subset of the metastatic population. 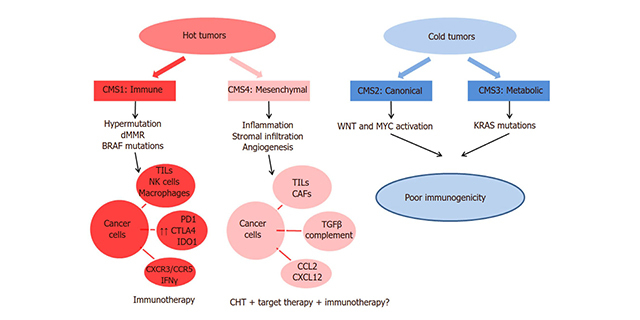 New ongoing studies focus on converting an immune ignorant tumour into an inflamed one by combination therapies and on introducing an immunotherapeutic approach in earlier stages of disease (neoadjuvant and adjuvant setting). In this review we summarize the current knowledge about the molecular and immune landscape of colorectal cancer and propose new potential combination strategies to enhance the efficacy of immunotherapy. J Cancer Metastasis Treat 2018;4:28.